Recommended for its educational value by John Sebastian, Marilyn Horne, Andre Watts, Peter Shickele and the late Jim Henson. Tuned to C Major, the Chimalong can be played by number, color or notes. 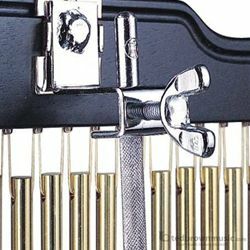 Comes with an extra #7 tube, which changes the B (for key of C) to B flat (for key of F), giving greater musical flexibility. Also comes with two mallets & color coded songbook.